I’ll try to make it to the early session but I might have to be in two places at the same time to manage it because I’m making arrangements for a new show of my oil paintings to hang on campus at the University of California Santa Barbara. However I do plan to pop in at the second session. Not only that but Isobelle Winter will be with me launching her first book, a steampunk science fiction novel entitled Weather about a snarky reluctant hero whose entire world is shifting under his feet even as he believes he’s finally got a handle on it. Yes, Isobelle is our daughter, but what’s fun is that she submitted her manuscript to Eternal Press under another name, so as far as I know, they had no clue we were related until after they sent the contract. Then she decided to share my pen surname. So here we come, a dog and pony show– but don’t ask me who’s the pony! Makes me chuckle. 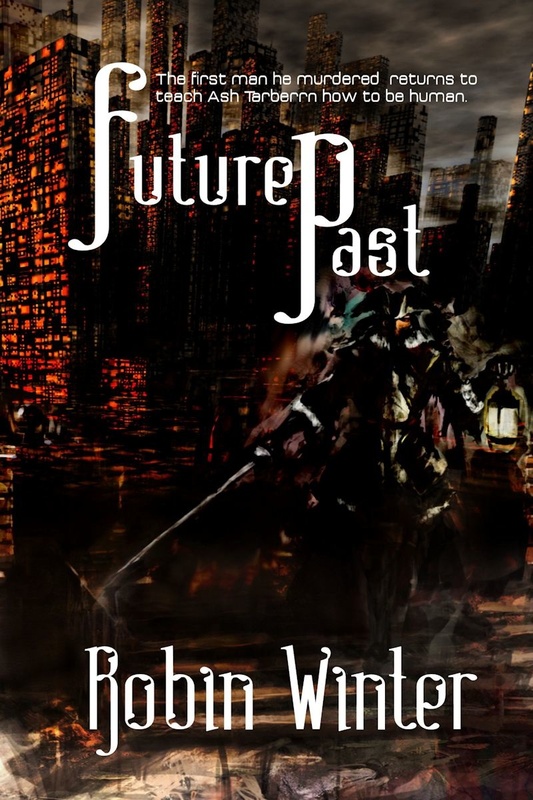 I find myself thinking about all the people writers and friends and family who helped bring Future Past to publication. Thank you all. This book has a particular significance to me though I knew that most readers may shy away from the main character. But the world I depict him living in approximates the one I anticipate, with human kind making many drastic changes to lifestyle and expectations, creating floating urban blocks, eating a reduced diet, with pure water as the most sought after prestigious drink available. Adapting to the circumstances we forge in our world now. Now I will take a deep breath and try to get myself in order for release day. First comment, never interfere in a cat fight. Second comment, if one erupts on your lap, make sure it’s not on a weekend, or after your doctor’s office hours. Amazing detail, notice after the noise and spray of fur is past, how your hand which was in the middle of said cat fight, is swelling up like a balloon. That isn’t from cat scratches or even cat bites (mine are too well-mannered to have bitten… this time) it’s from the incredibly powerful little-advertised cat kick. Consider the soft furry haunches, bunched with muscle. Consider the sinews, flexible and spring loaded. Now your hand looks like a pink softball. Ice is a very fine idea. However, examine first. What are the wounds that drip lovely carmine on your clothes and carpet? Punctures or slashes? Punctures mean go and see your doctor. Infection and Augmentin are likely shapes in your future. The faster you start your antibiotic the less your future discomfort. Perhaps more important, the less your possible future need of hand surgery. The hand is compartmentalized in its structure which means that all that bone and sinew work against great circulation and the flushing of toxins. It means that you can, if unlucky, get an infection in a tendon sheath. So if you have punctures, you have your marching orders from a fellow survivor. A tetanus booster is a splendid notion. If not, I recommend letting the slash bleed very well, slather with povidone, dry, and use some butterfly bandages to pull the edges together. Watch that wound with skeptical care because even purely indoor cats carry quite sufficient biota on their lovely claws to cause a fine infection even of a nice open-type wound. Discretion is the better part of suffering. This event happened in my home several years ago, and I escaped without a real scar in spite of all the drama. It’s useful to remember that when angry or afraid a cat’s eyes dilate and they become unable to focus. No cat in this condition can distinguish friend from foe which is why they will attack each other as well as the interfering human…. Gray morning, we may be starting the summer pattern here with the sea fog hanging high in the early part of the day, sometimes dissipating in the afternoon. Hard to concentrate, though you’d think my dark little study would echo the day and allow the best of focus. But I’m not there. I’m wandering about picking up things and putting them down, poking at ideas. I’ll be baking cookies for the memorial service for Professor Norris later today. Maybe that’s what troubles me. Not the baking, that’s always good except for the days I get distracted and scorch a pan of cookies. Husband always says, ”you have a timer, don’t you?” and I stick out my tongue at him and say “having isn’t the same as using.” Because I can’t seem to bother with the timer. I always feel like I should grock the doneness of the cookies, and ever since I got these ovens from the Restore (Habitat for Humanity re-sale store in town) the insulation on them is so good I get no clues from the smell that the cookies are nearing perfection. So what is it? Simply that I’m feeling losses today? Missing Professor Norris who was one of the first people to make us feel like we belonged here in California when we arrived over twenty five years ago? With his dry humor and disciplined manner, the twinkle in his eye and his bow ties? He had just retired, and my husband was taking his spot in the department. One bow tie saluted another. Professor Norris’ passing last year left an empty place. I recall him taking swarms of students out into the field, old desert rat that he was, knowing every stretch of wind-blasted open, every stunted palos verde, every triumphant Joshua tree. Geology by day, tracing the history that brought these stones, these mountains into place and the forces that will in time to come, move them on. Stories in the flickering light of the campfire of the time one of his companions on an expedition to Mexico developed appendicitis and the desperate race to get him back to a doctor and surgery, a wheezing Ford rattling its way in the grim and lonely night. But he was tired those last weeks, he hated the walker and the falls, missed the questions of the students, the freedoms of his desert territory. Missed tending his own garden. We owe him our garden. He and his wife decided when they heard their neighbors discussing selling their home that we would make good neighbors, and that’s how we ended up here in this rustic corner of land with rows of trees and the land and home that have so enriched our days. And by the way, those second-hand ovens from the Restore? I had new electronic double ovens that cost me over $1200 but their brains started going. Got the brains replaced by a nice tech, a couple hundred dollars more, and as soon as that one year warranty ran out they started to think their own thoughts again. I used to flip the breaker before leaving the house because I’d caught these ovens turning themselves on to preheat. I donated some items to the Restore and my eye noted that they had ovens for sale. Big heavy duty analogue control panel ovens. I admired the insulation, opened them– no one had bothered to clean them before donating. I checked the enamel, scraped at the old cheese. I figure these ovens, Kitchenaids, had only been used for pizza – in fact the pizza stone was still inside. Bought them for $29. No, I didn’t forget any zeroes. Installed for $150. Best baking ovens ever, and they never thought of thinking for themselves at all. Two days ago I hit send on the final edits of Future Past. We’re done now, publication’s slated for this May, 2013. I’m soliciting blurbs for the cover, and drawing a few deep breaths. What a fascinating process. I’ve known a lot of great editors — been really lucky in my experience, but I feel as though this was the best yet. Not because my prose was perfect and remained untouched by my admiring editor… far from it. Oh my word, you should have seen the scads of edits suggested! I love my character Ash Tarberrn. He’s one of my all time favorite characters, and like many of them he arrived in a dream. I stood in his skin in a terrifying blank room full of yellow light with blue shadows, and felt his feelings and his actions as he took the arm of his best volunteer and inoculated the naked man with a deadly virus before sending that man forth to eliminate the Free World’s enemies. Maybe not an endearing sort of fellow, you might think. He didn’t like himself either, and it was the raw and damaged parts of his character that caught me up in his life. I saw the world we are creating now by our actions, the floating cities of our future earth through his eyes, heard his thoughts as he remembered the poetry he read describing the mighty grandeur of a blue sea, but looked out upon an ocean tamed with rubbish and pollution nearly to the point of allowing him to walk like Christ himself upon it. He had a long journey to make, and I wanted to know if he could. I didn’t plan on writing more than one story about Ash, but he kept coming back to visit. Some days I felt as though if I turned around fast enough in my dark study, I might catch a glimpse of him sitting quiet in the Harvard chair in the corner, waiting for me to have time to write his next tale. He showed up in the shadows of another novel, haunting his grandchild. I’m now editing another of his stories, and I know there is at least one more, with something dreadful in it, though I haven’t dreamed the truth yet. But I have two complete manuscripts thanks to him, all set in my Future Earth. What is fascinating to me, and heartening beyond any gift, is that Kim Coughlan,(www.coghlanwriting.com) the editor I received from Eternal Press, met Ash and understood him. Ash is difficult, he has a negative voice. It’s always easier for him to say what a thing is not rather than what it is, and while I tried to turn things around to make him more readable, he rode roughshod over my druthers again and again. Kim took the manuscript, shook out the indirections and set us on a clear path to our story. All of this without violating Ash’s voice, and let me tell you that was a brilliant bit of work. So if you meet with an editor who can remain unruffled by your writerly peculiarities, remote from her private prejudices, cool in judgement but invested in your desires, who can sense the right times to hold back and the right times to interfere, it’s time to quote Hamlet.